antiques. The tropical gardens is where John J. Open daily 9:30 am - 5:00 pm. The carefree, car free way to visit Key West. to be enjoyed....without a car! passes that will save you time and money. Conservatory hours 9:00 am to 5:00 pm daily. Call for group rates and details. that set the stage for the "flowers of the sky." 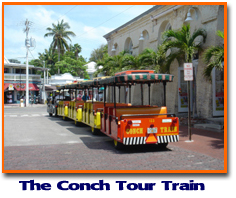 visitors to Key West since 1958.
tours run from 9:00 am to 4:30 pm. The Couch Tour Train is open everyday and tours run from 9:00 am to 4:30 pm. Park and Fort Jefferson have a fascinating history and beautiful beaches for divers and snorkelers. Monument and in 1992 was designated a National Park. brainstormed the search for the Atocha and her sister ship, Santa Margarita. photos and artifacts combine to make this a fun and educational experience. Tours meet at the Porter Mansion at the Corner of Duval and Caroline St.
tour into the restless spirit world of our tiny island. hidden aspects of Key West that only a "Conch" could show you. Visit the home of the Nobel Prize winning author. Have and Have Not". Guided Tour. is $7 for guided and $5 for self-guided tours. gather in Key West from all corners of the globe. times as you like as you make one complete loop. minutes. Tour at your own pace. journey back 300 years of high seas adventure. The last tall ship built in Key West ~ 1939. The official flagship of the city of Key West. the Caribbean and South Atlantic until 1974.
tower make the experience one of a kind. Open daily from 9:00am - 5:00 pm.